Love, Mrs. Mommy: Blogger Opp: 5 Winners! Litom LED Outdoor Motion Sensor Solar Light + $10 Amazon Gift Card Father's Day Giveaway! $250 TRV! Blogger Opp: 5 Winners! Litom LED Outdoor Motion Sensor Solar Light + $10 Amazon Gift Card Father's Day Giveaway! $250 TRV! Love, Mrs. Mommy is hosting a multiple winner giveaway for Litom! 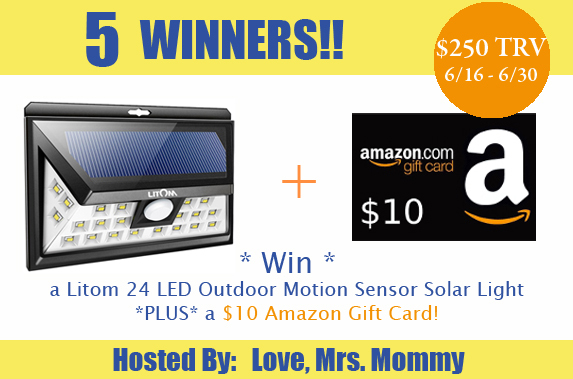 5 Winners will receive an LED Outdoor Motion Sensor Solar Light + $10 Amazon Gift Card! A $250 TRV giveaway!